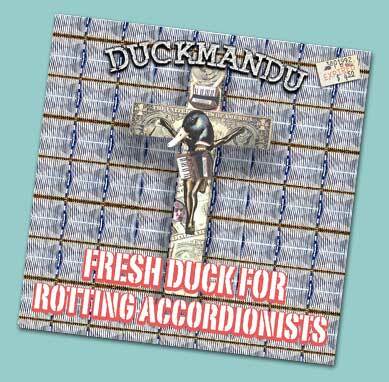 The definitive accordion version of the first Dead Kennedys record plus other punk tunes by the pyrotechnically virtuosic accordio-vocalisticator DUCKMANDU! Some soundbites from the album are here! 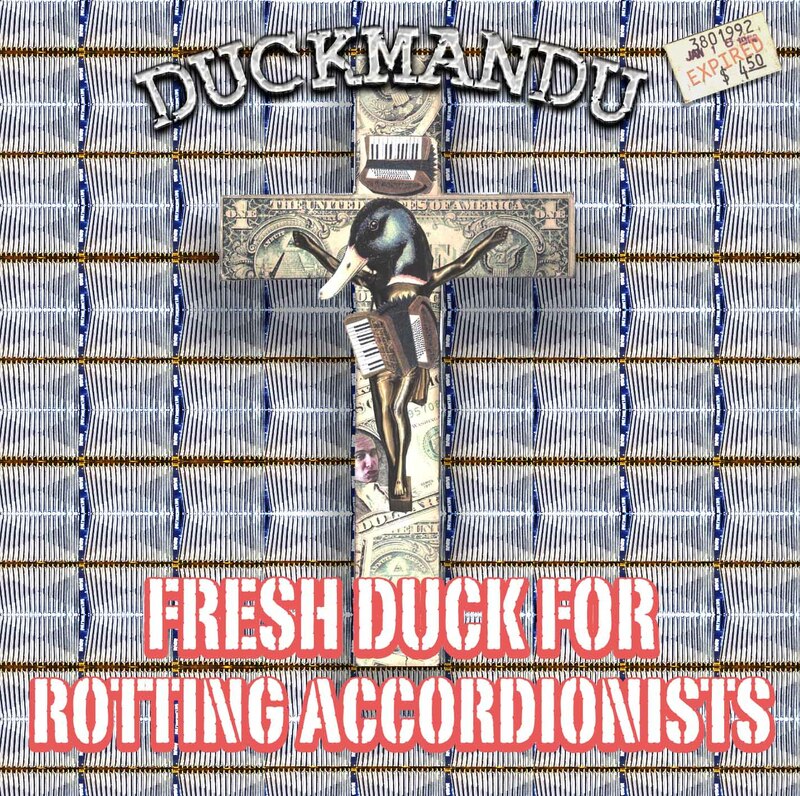 "Fresh Duck for Rotting Accordionists" is a solo accordion (with vocals) version of the first Dead Kennedys Album "Fresh Fruit for Rotting Vegetables." Also on the CD are six additional punk tunes by the Minutemen, D.R.I., Black Flag, Aaron Seeman, DEVO, and one extra by Dead Kennedys. "Fresh Fruit for Rotting Vegetables" by Dead Kennedys is truly one of the great albums in any genre. The level of musicianship is extraordinary. And although it is a "punk" album, it shows influence from surf, doo-wop, atonal music, and flamenco. However, the style of Dead Kennedys on this album has to be seen as a genre all its own. In a sense this project was a science experiment which posed the question, "Would it be possible to play this very difficult music, note for note, on the accordion?" There were certainly moments when success seemed unlikely. "Fresh Fruit" was released in 1980, so 2005 is the twenty-five year anniversary of this remarkable work, a great time for "Fresh Duck" to be released. 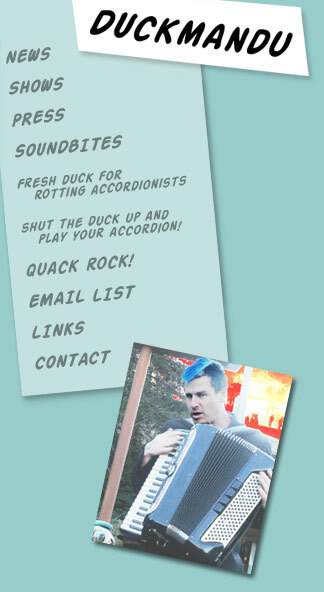 Aaron Seeman (as Duckmandu) plays accordion and sings. He recorded and mixed "Fresh Duck for Rotting Accordionists" at his home/performance space the FISHTANK in Oakland, California. In addition to punk rock, he accordionizes classical, klezmer, Broadway show tunes, country, 70's rock, and other styles. He is a founding member, arranger, and vocalist with the Punk Rock Orchestra, which performs full scale orchestral versions of classic punk songs. He also performs with the Romanian folk ensemble, Fishtank. He has recorded with Mr. Bungle and Estradasphere. He composed and produced the modern classical opera "Opium: Diary of a Cure." Klaus Fluoride sings backup on five of the tracks. Klaus is the bassist for the Dead Kennedys and is for the most part duplicating the vocals he sang on the original album! Jason Webley sings backup on three of the tracks. Jason Webley is an incredible performer and accordionist with a nation-wide cult following. His performances are not merely shows, they are more like revival meetings. Winston Smith did the cover, a parody of his own Dead Kennedys cover from "In God We Trust Inc." A world-renowned collage artist, Winston Smith has done album covers for Green Day, George Carlin, did most of the Dead Kennedys covers and designed the famous DK logo. He has recently done two covers for the New Yorker magazine. Anonymous Bosch (AKA Scott Reed) did the comic strip, layout, and drew the metatonic accordion. He is one of the founders of Filth Magazine and the editor of Art Core. The 60+ voices in the Chemical Warfare Rocky Mountain Arsenal Memorial Choir of Death (track 8) include many friends and notables from the world of punk rock and underground performance. Dirk Dirksen (the godfather of punk rock) ran the San Francisco punk clubs Mabuhay Gardens and On Broadway for ten years. Greg Ginn was the guitarist for Black Flag and wrote Police Story (Track 17). Trey Spruance (AKA Scummy) was a guitarist for Faith No More and the avant-rock band Mr. Bungle. John Gluck is the director/conductor of the Punk Rock Orchestra of San Francisco. V Vale is the founder and editor of RE/Search publications, who's books include such seminal volumes as "Modern Primitives," "Pranks" and "Incredibly Strange Music." Note: Except for Tracks 13 and 19, there is no overdubbing of accordion parts.